The organizers of last year’s Women’s March are happy to be led by Israel-hating extremists who openly seek to ostracize pro-Israeli feminists. Companies seek to boycott Israeli Jews, and only Israel Jews, because they are Israeli Jews, with businesses located in the disputed territories of the West Bank (Judea/Samaria). The next British prime minister could well be a man who laid a wreath honoring the terrorists who murdered in cold blood eleven Israeli athletes at the 1972 Munich Olympic Games and who has called the genocidally-inclined terrorists of Hamas his “friends.” And even in America, newly elected members of Congress openly espouse the strategy of boycotting, divesting from and sanctioning (BDS) Israel. Consider these developments for a moment. Last year’s so-called “Women’s March” (conservative women who declined to be associated with it are apparently not women) was led by Linda Sarsour, a supporter of antisemite Louis Farrakhan (who recently described Jews as “termites”) and shared a platform with Palestinian terrorist murderer Rasmea Odeh, whose “resistance” she lauded. As an exponent of intersectionality, Sarsour supports excluding from the progressive camp anyone who supports Israel and Zionism. Today, to support vicious antisemites in pursuit of an illiberal agenda seems to be a non-event — providing one is on board with other, approved leftist causes. Intersectionality is providing a safe space for rabid hostility to Jews and Jewish national independence. Such associations would once have induced a news cycle of dismay and criticism of someone like Sarsour. All the more so, when one considers her vicious attacks on genuine feminists who have criticized her radical Islamic agenda, like Ayaan Hirsi Ali, a Somali-born, genital mutilation survivor and human rights activist who fled radical Islamic death threats in the Netherlands, and Brigitte Gabriel, a Lebanese-born Christian refugee from radical Islamic atrocities. Today, however, to support vicious antisemites in pursuit of an illiberal agenda seems to be a non-event — providing one is on board with other, approved leftist causes. Intersectionality is providing a safe space for rabid hostility to Jews and Jewish national independence. For another sign of the times, consider two new Democratic Members of Congress elected in the 2018 midterms, Rashida Tlaib and Ihlan Omar. Tlaib calls Israel “racist” and supports its replacement with a single, Arab-dominated state. Omar has labeled Israel an “apartheid” state, damned it as guilty of “evil” acts, and is the first open Congressional supporter of BDS. Omar misled voters prior to the midterms by opposing BDS, which she admits to supporting now that she has been elected. Her efforts to minimize the blatant contradiction by asserting that she doubts the efficacy of BDS in bringing peace alters little. All she is really saying is that she doubts how useful BDS might prove to be in demonizing, ostracizing, and harming Israel. The clear implication is that, if BDS were highly effective at these things, she would support it even more wholeheartedly than she already does. Support for BDS once would have been news. Yet the public is not being permitted to even know of Omar’s support for it. PJ Media’s David Steinberg identified 105 news stories on Omar written in the immediate aftermath of her election victory, not a single one of which even mentioned her extreme statements. In short, today, antisemitism and extreme hostility to Israel, up to and including opposition to its existence, are being normalized. The ultimate test of normalization is when something ceases to be news, as Omar’s demonization of Israel as “evil” and support for BDS attests. It is true, the rot is not quite as advanced in America as it is, for example, in Britain, where Jeremy Corbyn is already the leader of the British Labour Party, Leader of the Opposition and, quite possibly, the next Prime Minister. Here, as liberal Zionist Amanda Berman observes, “the [Labour] party has become a hotbed of the kind of anti-Semitic worldview previously confined to the political fringe.” Quite simply, this is a new level in the intensity of anti-Semitism being expressed, tolerated and paraded in Britain. These facts –– the increasingly widespread, shameless association of leftwing figures with antisemites and terrorists with Jewish blood on their hands, and the widening of support for BDS, coupled with the remarkable neglect and lack of interest in the issue in the media –– are symptomatic of the normalizing of antisemitism to a degree not thought possible only a few short years ago. Only in such circumstances can one be unsurprised, for example, by the wall-to-wall ignoring of Representative-elect Omar’s vicious statements about Israel. In a situation in which antisemitism is increasingly normalized and thus not news, it is as if Omar’s hatred of Israel is simply so unimportant that it does not bear mentioning. Otherwise, how can it be that no journalist reported on her hostility? Isn’t this an aspect of her record and views the public are entitle to know? And why did no one in the Democratic Party take a stand and criticize her? Where were the pro-Israel Democratic legislators? That which was unacceptable yesterday can sometimes become acceptable today and unremarkable tomorrow. If we are to avoid that progression, those concerned with the welfare of Jews – worldwide, but not least in America –– must devise strategies now for combating this pernicious development which, if unchecked, can have terrible consequences for Jewish life everywhere. 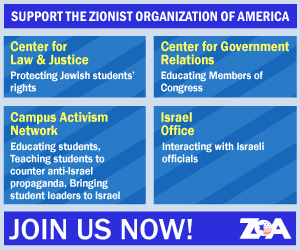 Morton A Klein is president of the Zionist Organization of America (ZOA). He’s a former biostatistician with the Linus Pauling Institute of Science and Medicine. A national Jewish weekly named him one the five most influential Jewish leaders in America and another named him one of the top dozen Jewish activists of the past century. Follow him on twitter @mortonaklein7 and ZOA.org.